Focus on your patient,not manipulating software or buttons. The CS 3600’s Intelligent Matching System allows users to freely fill in missing information for any area in the data set for more efficient scanning. There’s no need to indicate an exact location to the system or to follow a specific direction —simply jump to any position in the mouth. "In our opinion, the CS 3600 intraoral scanner is superior. It’s faster and makes image capture quite easy. We’re totally blown away. The HD 3D imaging is fantastic since you can see the color of the tooth, gums and margins much clearer. I love it, and everybody in my office who uses it loves it. The CS 3600 allows my assistants to go and scan everything before I even get to the chair—whether it’s the whole arch or just half an arch. I then prepare the tooth, cut out the prepared area on the scan and then rescan that spot. Doctor time for the scan is about one minute. The CS 3600 has become a vital part of our practice." “We needed a good, reliable scanner that we could go the distance with. 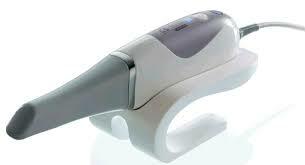 The CS 3600 intraoral scanner is the preferred scanner in my practice. The refinement is faster and my staff can get in and get the job done in a quick but accurate way. The scanner is comfortable to use; lightweight and portable. It’s very slick.